A tourist paradise, the land of rising sun or dawn-lit mountains is full of green valleys, blue hills and white, sparkling rivers that catapult visitors to a mesmerising world of fantasy that abounds in rich flora, fauna and wildlife. The local tribes are warm, convivial and meet the visitors from the mainland with generous hospitality. 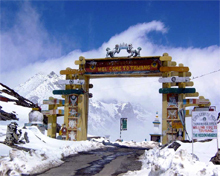 But if it is a family tour to Arunachal, then it is important to plan and proceed with the help of official guides as there are plenty of places to visit and get enthralled by this paradise on earth. Given the strategic location of Arunachal, domestic and foreign tourists have to get an ILP from the Army officials detailing the purpose of their visit, duration of stay and places they are going to visit. Since the ILP is only a formality, tourists will get it if applied following the usual protocol. 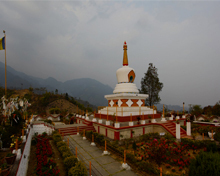 The capital city of Arunachal has many tourist spots and venues. The historical fort made of bricks from which the city derives its name is 14-15 centuries old. The Raj Bhavan, the official residence of the Governor, Jawaharlal Nehru state museum and the legendary Ganga lake (Gyakar Sinyi) are worth a visit. Home to the tribes like Monpa, Sherdukpen, Aka (Hrusse), Miji and Begun (Khawas), this is a scenic locale with lush forest cover on the hills. Colourful gomphas tucked in the brilliant landscape makes it an ideal Himalayan destination. The meandering highland pass that leads to this beautiful valley is one of the tourist attractions of Arunachal. This is the land of 400-year-old Tawang monastery, which is the birthplace of the sixth Dalai Lama. The monastery house gold lettered copies of sacred Buddhist script. 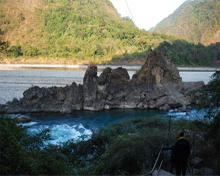 According to mythology, Parashuram, a great sage of ancient India, had washed his sin of matricide in the banks of the river Lohit, which later came to be known as Parashuram Kund. People come from far and wide to take part in the Parashuram Mela during the month of January. Mythology says Lord Krishna carried away Rukmini, one of his many wives, from this place, then a kingdom ruled by her father Bhismaka. The excavations have revealed an early settlement of the Aryans at Bhismaknagar. An old temple dating back to 7-8 century is now in ruins in this place. A series of excavations have unearthed a decorated basement of a temple, icon of deities, animal motifs and floral designs, carved columns and panels reminding of an unknown past. It is said that when the Lord Shiva was frantically carrying the body of His consort Parvati, Lord Vishnu cut her body into pieces with Sudharshan chakra. 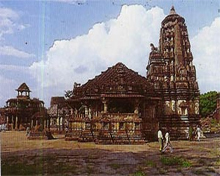 One of the pieces fell on this area and hence, this place is considered divine among Hindus. Akashiganga provides a magnificent bird's eye view of the Brahmaputra river shimmering down far below. 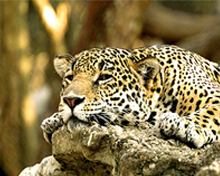 As many as 7 wildlife sanctuaries and 4 national parks of various dimensions pull visitors from all over the country to Arunachal. For wildlife enthusiasts, Arunachal opens up a big treat in terms of sheer numbers and diversity: Elephant, tiger, gaur, barking deer, red panda and black bear, to name a few. Five major rivers - Kameng, Subansiri, Siang, Lohit and Tirap - branching out from the giant Brahmaputra and countless other rivulets crisscross this green oasis. The free-flowing rivers offer good rafting and angling opportunity for water adventurers. 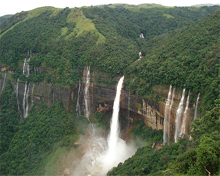 The climate of Arunachal swings to the extreme with the altitude. The southern part of the state is hot and humid just like a sub-tropical climate. The central region is mostly cooler while there is alpine climate in the higher altitudes. Rainfall occurs sporadically with uneven precipitation across the districts throughout the year. The wettest period of the year is from May till September. 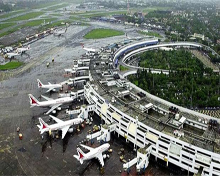 By air: There are three airports in Arunachal that are connected to Guwahati and Kolkata. There are regular buses from these places to major tourist destinations. By rail: Arunachal does not have any railway connection at present. 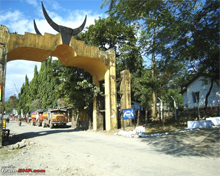 The nearest railway station to Itanagar is North Lakhimpur (60 km) in Assam. For other important places, the nearest railway stations are Silapathar for Along, Tinsukia for Tezu, and Margherita for Namdapha. By road: Arunachal Pradesh State Transport Corporation and private operators provide intercity and interstate bus services that are reliable and comfortable. Guwahati is at a distance of around 381 km from Itanagar. Distances of some tourist places in Arunachal from its capital Itanagar are Mallini Than, 162 km; Bomdila, 360 km; Dirang, 403 km; Parasuram Kund, 795 km; Namdapha, 640 km; Ziro, 168 km; Pasighat, 280 km; and Along, 335 km.